Manuel Antonio national park is not only very easy to get to and easy to stay near, it’s also one of the easiest places in Costa Rica to see wildlife. This tiny park is one of the last places you can see virgin Pacific coastal lowland rainforest outside Corcovado National Park and the only place you can see it then return to luxury lodgings and your choice of fine restaurants. The well maintained trails and highly trained naturalist guides carry quality spotting scopes and practically guarantee you’ll add to your animal or birding “life list.” Howler, Capuchin and highly endangered squirrel monkeys, sloths, pizotes (coatimundis) and dozens of bird species know they’re safe within the park boundaries and go about their routines mostly ignoring visitors. 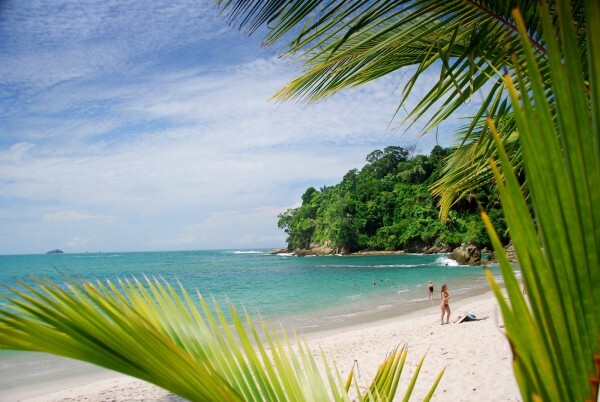 The ultimate romantic honeymoon destination, there are more luxurious spots to view the spectacle of the sun sinking into the Pacific over waves dramatically crashing on the rugged shore in Manuel Antonio than anywhere else in Costa Rica. Whether it’s from a private balcony, your own infinity edge pool or the terrace of one of the excellent restaurants you won’t find a better place to share a bottle of wine and quiet romance. You certainly don’t have to, but it’s easy to spend over a thousand dollars a night for a suite in the Manuel Antonio area and many claim that the best hotels in Costa Rica are here. It’s not the adventure capital that Arenal is but Manuel Antonio is no slouch when it comes to adrenaline. The Ríos Naranjo and Savegre have great class II through IV white water rafting sections (especially when it’s rainier May through December) and you can take a sea kayak along the rugged coast to hidden snorkeling spots. There’s an excellent canopy zip-line along the road to Napoles and possibly the longest cable in Costa Rica (many tours claim this distinction and we haven’t actually measured) is a short drive up the road near Jacó.